When society breaks down, it seems like people go crazy. But they aren’t suddenly just taking leave of their senses. They’re acting in their own best interests, taking what is available so that they can survive. The fear and chaos that come from a social breakdown can cause people to reconsider priorities and relationships. We see stuff like this portrayed all the time in zombie movies and shows. Alliances can shift at any moment, and you can find the team that had your back moments ago now gleefully stabbing it. This is the idea behind The Dark Zone, the cordoned off neighborhood at the center of The Division. After desperate attempts to protect the area, the Dark Zone was eventually abandoned – hastily – by the military that occupied it. The area remains heavily infected, but filled to bursting with high level military equipment. The Dark Zone can be summed up with the name of 50 Cent’s album, Get Rich or Die Tryin’. 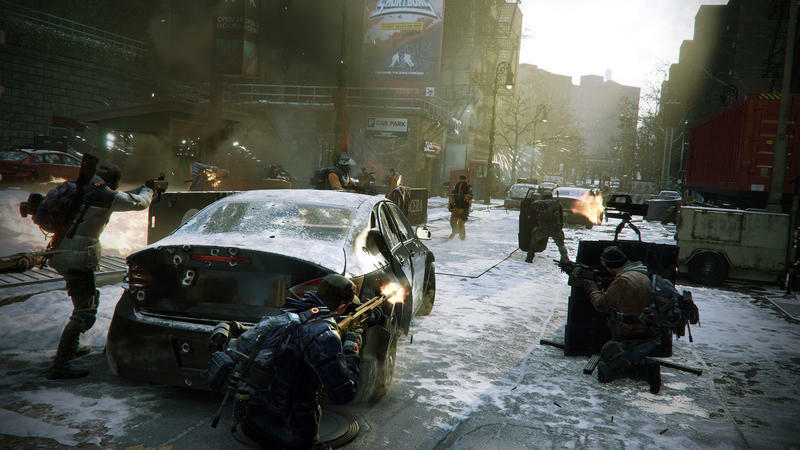 The Dark Zone is The Division‘s biggest hook – both its best bet at lasting popularity but also the element that might be the most off-putting to many players. The best loot is in the Dark Zone, and so is the greatest danger. The enemies there are far more dangerous than those outside and require more planning and better equipment to take down. This is also where the game’s player versus player combat comes into play. 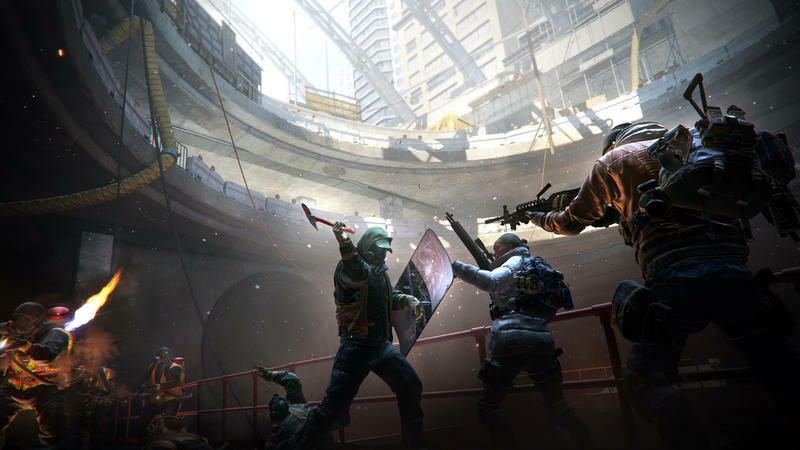 You can enter the Dark Zone alone or as part of a group, and as you approach you’ll be automatically matched up with people of a similar Dark Zone rank – this is separate from your level, which you gain in the outside world. This ensures that you don’t end up in some sort of David and Goliath situation (where David mostly just gets stomped on instead of taking down the giant). Everyone you encounter in the Dark Zone is simultaneously a potential ally and enemy. When you spot another player, they’re neutral until one of you opens fire. If you’re with a team, you and your team are exempt from this – friendly fire is off in the Dark Zone just like in the greater map. Even then, though, you can drop from your team’s party mid-game as we’ve seen in live demos, and become a threat to those you trust. The potential for profit is great, and the risk even moreso, as you’ve not only singled yourself out from the other players on the map, you’ve now turned your teammates against you. 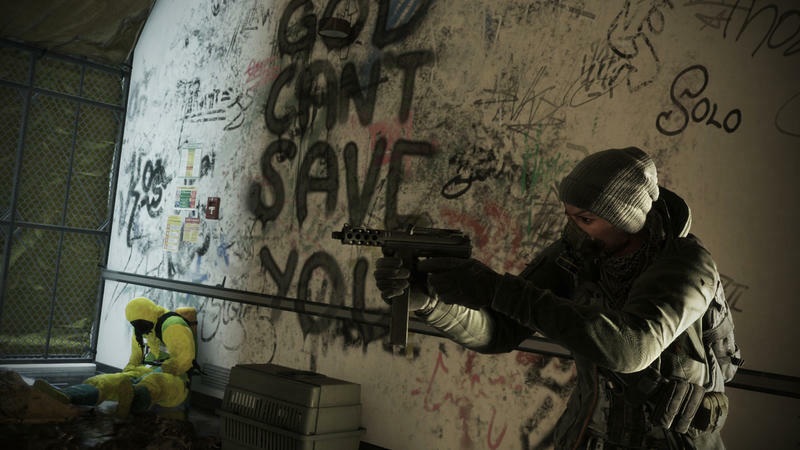 Enhancing the opportunity for awesome stories and heartbreak is the Dark Zone’s proximity chat. You can turn this all the way down in the options, just in case having 12-year-olds question your parental lineage and sexual preferences isn’t something you’re willing to risk. If you leave it on, though, there’s a lot of opportunity for awesome moments reminiscent of games like Day Z. Two elements mitigate the potential frustration of those more lawless examples. Unlike in Day Z and the like, you can’t lose the equipment you already own. 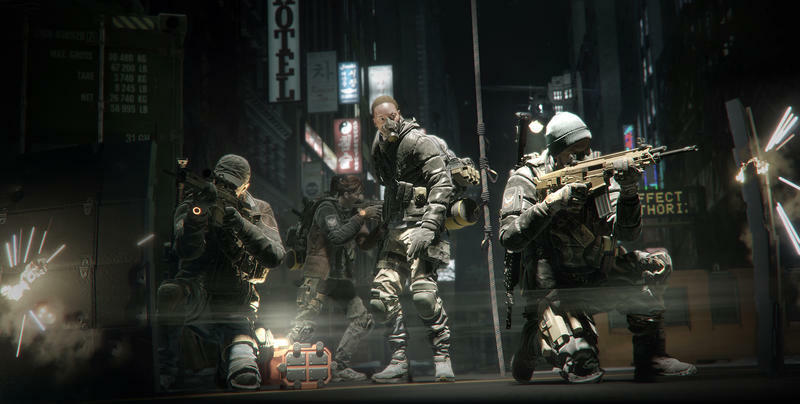 Loot you’ve picked up in the Dark Zone also comes in two forms, public and private. Should you fall, whether to high-leveled AI or to trecherous players, your private loot is safe as long as you head right back in. No one can see or take it, though they could potentially camp if they just feel like trolling you. The public loot, on the other hand, tends to be better and can be stolen, stolen back, re-stolen back, and so on. This creates a nice risk-reward system that feels rewarding without feeling totally brutal. The other element that helps mitigate the trust issues inherent to the Dark Zone is the bounty that appears on rogue agents. If you’re thinking of betraying your team or if your team is on an agent hunt, you’ll be more appealing to the more upstanding members of the Division, who will receive a reward for taking down greedy agents. The Dark Zone also has its own progression system. 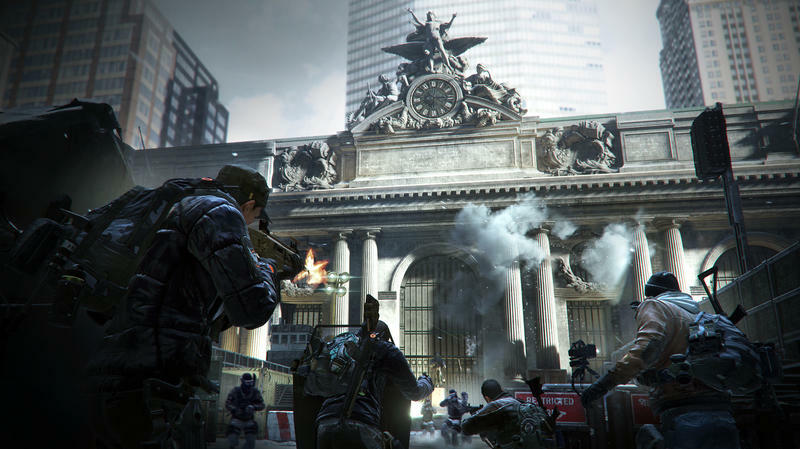 Your level, which caps out at 30, will still determine which items and weapons you can use and what other players you’re paired with, but your Dark Zone rank, generated by fighting and winning and performing other actions in the Dark Zone, will give you access to things like special equipment caches and crafting recipes. This is where the end-game content is that will keep players coming back night after night. Elements like crafting don’t really chime in until this point. The system isn’t simple, but once you get used to it, the risks and rewards you’ll be weighing at any given moment, and the situations that come out of that are where The Division will leave its mark. Outside the Dark Zone, there’s shooting, leveling, progression. Inside, there’s betrayal, close shaves, turnaround victories, and all kinds of great stories just waiting to be written. The Divsion is set to release for PC, PlayStation 4, and Xbox One on March 8. Stay tuned today and early next week for our thoughts on the game’s real-world inspiration and more. In the meantime, check out what we thought about the game’s tactics and combat. Note: Our time with The Division was spent at an official preview event hosted by Ubisoft. 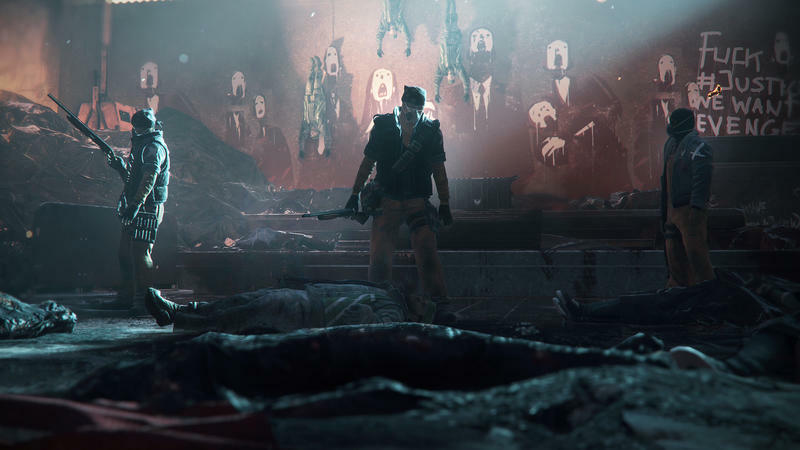 All footage was acquired through live gameplay recorded on Xbox One.